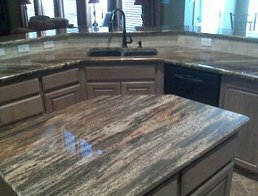 With all the options available for custom countertops, you may be asking yourself, "Why should I choose granite?" or "What benefits does granite have to offer?" 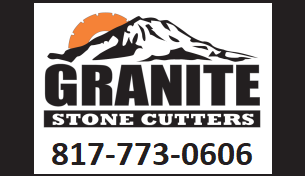 Below we have provided a comparison so that you can understand your investment in your new granite countertops by Stone Cutters. If you have any questions or we can assist you in any way, please do not hesitate to contact Stone Cutters at 214-502-8029. For your convenience, you may also request services from this site. Granite is the most durable countertop available. According to the Marble Institute of America, the newest piece of granite on the planet is almost 750 million years old. No man-made product can match the natural beauty of real stone - the colors are extremely vivid and the look is breathtakingly rich. The shine of natural stone is not the result of an applied finish - it comes from polishing with diamond abrasives, and polished granite will keep its high gloss virtually forever. Although pricing is on the higher end of the countertop market, the durability of granite makes granite the more "cost effective" option. In conclusion, granite has proven to retain its' beauty and hold its value longer than any other countertop. Solid Surface" is an industry term for products such as Corian. Both Natural Stone and Solid Surfaces are excellent choices for countertops based on their own individual characteristics. Solid Surfaces are manufactured and will be extremely consistent. They also come in colors that do not exist in nature. Every inch of a Solid Surface is basically the same as every other inch, which may be a benefit to some customers. In addition, the seams are made with "liquid" Solid Surface material which makes them virtually invisible, whereas the seams on a granite countertop are more apparent. The variations found in Natural Stones unique veins and markings are part of its beauty and make it a true work of art which no man-made product can match. In addition, granite is much harder than Solid Surface materials and it will retain its beauty and hold its value longer than any other countertop.. Engineered Stone is a man-made stone that is known by many names, and though it may seem that a practical choice, engineered stone has some drawbacks that should be considered when purchasing stone countertops. These include the price of the countertop. 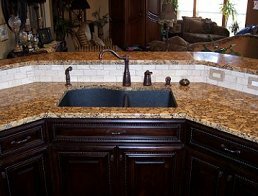 Creating an engineered stone countertop that can withstand the ravages of time is a long and labor intensive project, so those costs are reflected in the price of the countertop. In addition, because the engineered stone countertops are created and installed in solid slabs, there will be visible seams along the front edges and the deck of the countertop. This provides a place for water and contaminates to collect if the homeowner is not careful and diligent about removing these items from the seams of the countertop. After time, the water and contaminates collected in the seams of the countertop will begin to smell, which may require professional cleaning to get rid of. When you are remodeling your home and considering new countertops for your project, it is essential that you are fully knowledgeable of all of your options. We hope that this page has provided you with some valuable insight. If you have any questions or would like to schedule a free consultation with one of our designers, please do not hesitate to contact Stone Cutters at 214-502-8029. For your convenience, you may request services from this site.